We love it in Mac & Cheese, and cheese sauces! It is fabulous in cheese sauces, and in Mac & Cheese! It's amazing in Mac & Cheese, and cheese sauces! It's incredible in Mac & Cheese, and cheese sauces! 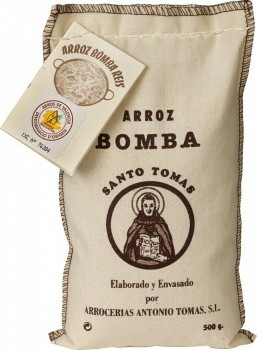 The production of Bomba rice is limited as it is very delicate and hard to grow. Its size is equivalent to that of short grain rice, sometimes even smaller, yet Bomba rice more than doubles its size when it is cooked. Its main characteristics are its great capacity to absorb flavors and aromas, and that when cooked it is always “al dente”, loose, and whole; it is never sticky, mushy, or fluffy. 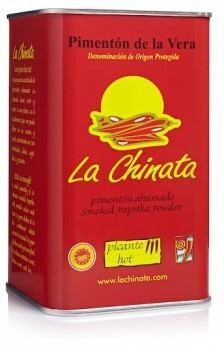 It is the preferred rice for paellas! Certified origin (Denominacion de Origen a.k.a. "D.O.") from the L’Albufera nature preserve in Valencia, Spain. Chestnuts aren’t just for the holidays anymore! 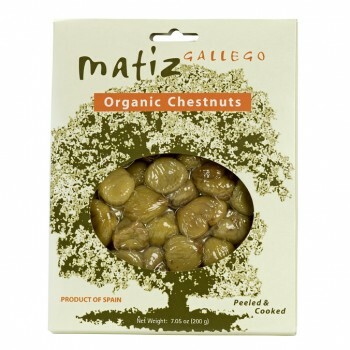 These amazingly sweet and moist organic chestnuts come from ancient groves of trees planted in the Galician region of Northwest Spain. They are purchased from small farmers throughout the region, bringing much needed economic assistance to the rural agricultural community. These organic chestnuts are very nutritious and lower in calories per ounce than other nuts. They are peeled, cooked, and ready to serve. Try them in your stuffing for the holidays, or in soups, casseroles, salads, and desserts all year long. Better yet, keep them in the fridge for a healthy snack! Originating in Spain and recognized as the "Queen of almonds," Marcona kernels are plump, finely textured and crunchy, with a delicate flavor and sweetness. These wonderful Spanish Marcona Almonds are sauteed in extra virgin olive oil, sprinkled with sea salt, and then vacuum sealed for maximum flavor and freshness. A beautiful balance of flavors... perfection! Unlike most of our competitors who have almond pieces mixed in with whole almonds, we hand select the almonds and deliver only whole almonds to you. 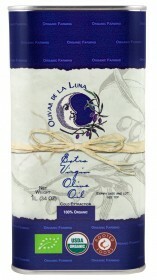 Our competitors also tend to use a lower quality sunflower oil, whereas we use extra virgin olive oil. It is a difference you can taste! 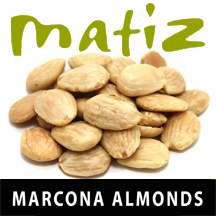 In order to ensure maximum flavor and freshness, these Marcona Almonds are vacuum-sealed. Therefore they can be stored anywhere, like your cabinet, desk drawer, or car, for a quick, healthy snack. They are also perfect to serve with aperitifs, as a complement to a cheese plate, or placed along side fresh fruit for dessert. This product contains no gluten, dairy, or genetically engineered ingredients. 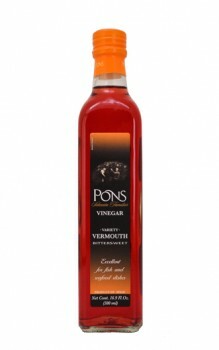 It is almost impossible to find a high quality Vermouth Vinegar. The process of making vermouth, fortified wine with a secret blend of botanicals, is a lot of work. So why would you go through all that effort if you are then going to make it into vinegar? Simple: magic in a bottle! 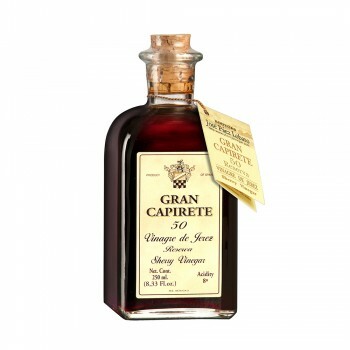 This Vermouth Vinegar is exquisite, and exotic, capturing the essence of vermouth in a tantalizing bittersweet vinegar. Substitute it into any recipe where you would use a white wine vinegar, from vinaigrettes and marinades, to fish and vegetable dishes, and feel your taste buds explode! 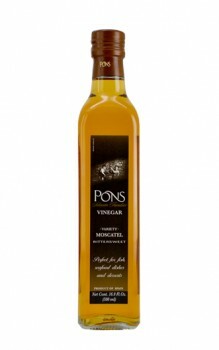 Ingredients: wine vinegar (99%), natural aromas (1%). These tender cod fillets are delicately poached in olive oil, a method long-revered for its superior preservation of flavor and texture. Caught in the icy-cold eastern Atlantic waters near the Faroe Islands, a remote archipelago between Norway and Iceland and one of the most pristine fishing regions in the world, this cod is transported with the utmost care, and then immediately processed by a small, family-run company in order to guarantee you are getting the most exceptional cod in the world! Niçoise-style salad, simply substitute cod for tuna. Eating fresh-out-of-the-jar with a hunk of crusty baguette. A sandwich: toast, sautéed vegetables, a dash of Piment d’Espelette Powder, and cod. Pastas with a pinch of chopped parsley and a spritz of lemon. Homemade Cod Taco with a nice salsa! Don't forget to save the olive oil for salad dressings, or drizzling on hot baby potatoes. Saveur Magazine said Bonito tuna is "one of the great gastronomic pleasures of every day life." 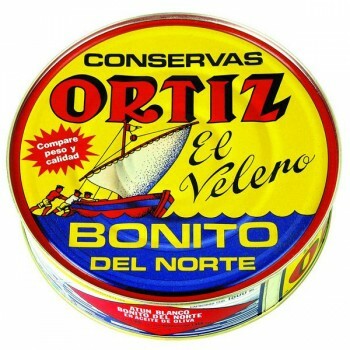 The Bonito del Norte is the most valued member of the tuna family - highly appreciated for its white flesh, exquisite flavor, and delicate texture. It is fished using traditional hook and line methods, thus preserving the wonderful texture and flavor which is often lost when fishing with nets. Only the best of the catch is selected to ensure exceptional taste, freshness, and quality. 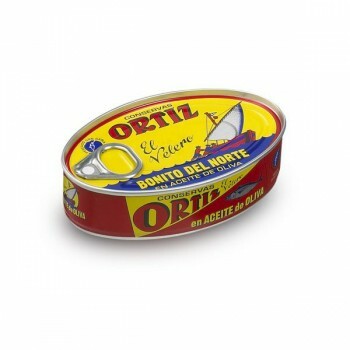 This dolphin-free tuna from the Basque region of Spain (Bay of Biscay in northern Spain) is then gently cleaned by hand. Putting them on crackers or sliced baguette for an easy, tasty, and healthy appetizer. 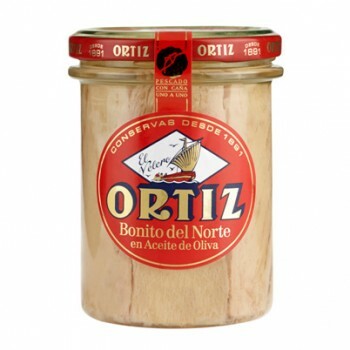 Ingredients: Bonito del Norte white meat tuna, olive oil, salt. 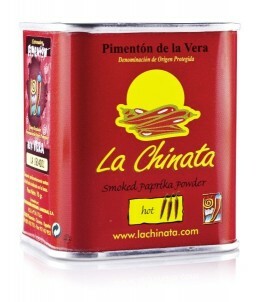 We use it for tuna sandwiches, stuffing piquillo peppers, on salads, paired with grilled fennel, and on crackers for appetizers. 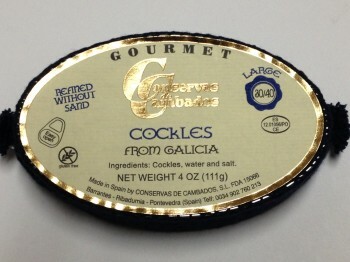 These exquisite anchovies, packed in the finest Spanish olive oil, are hand-packed according to traditional methods using carefully selected fresh fish harvested off the Cantabrian Coast in northern Spain. The anchovy, a traditional food of the Basque Country, is a mainstay of this region's fishing economy. The Spanish name "boqueron" comes from the size of the anchovy's mouth or boca, which is large in proportion to the rest of the body. Anchovies are typically harvested in the spring when they accumulate the most fat and flavor. Small nets are used to protect the quality of the fish and reduce by-catch. Once caught they are gutted, placed in barrels with salt-layer separations, and weighted. Once the fish have matured, about 3-7 months, they are washed to remove the bones and skin, and then canned in high quality olive oil. 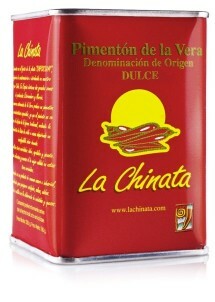 Anchovies are high in Omega-3 fatty acids which reduce cholesterol and help in the prevention of cardio-vascular disease. They are also rich in iodine, calcium, Vitamins A, D, B12, B6, B2, and unsaturated fatty acids such as linoleic acid. No preservatives or chemical additives. 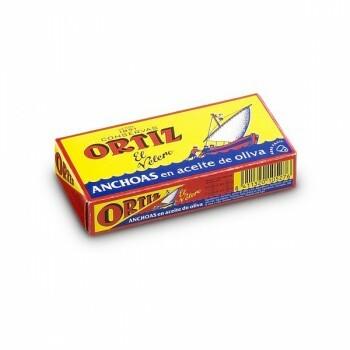 Ingredients: Anchovies, olive oil, salt. For maximum flavor and freshness please keep refrigerated once you receive them. 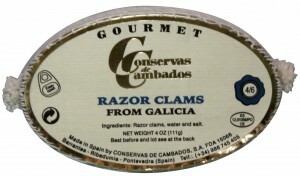 Razor clams (Navajas) are long, slender clams with a wonderfully rich flavor and firm texture. These perfectly cleaned clams are hand-harvested and then hand-packed in their own seawater. We eat them straight out of the can. You can also warm them in a skillet with garlic and extra virgin olive oil, or for some novelty we suggest you lightly grill them. 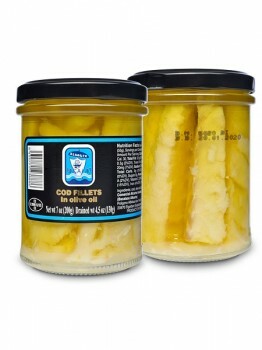 You may also want to try adding a small squeeze of lemon, a drizzle of extra virgin olive oil, and some crusty bread. 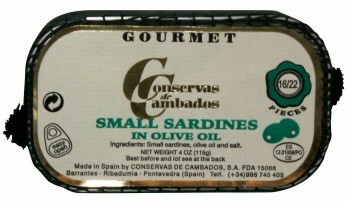 48 tins of these wonderful sardines at 15% off the single tin pricing! We're sorry but as this is already special pricing, additional coupons and discounts do not apply. We do offer FREE shipping on this case to USA addresses including AP/AE and US Territories. 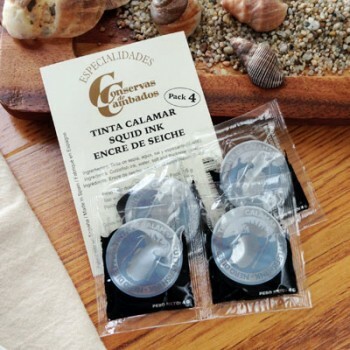 In the Mediterranean, squid ink is used in many recipes: Paella, risotto, black rice, soup, pasta, and of course Chipirones en su Tinta (squid in its own ink). It is also regularly included in seafood stews. In Italian cooking, it is used to prepare spaghetti al nero di seppia. Try it in this Black Rice with Squid and Shrimp recipe. Yes this squid ink is the same ink that they squirt at their attackers in order to escape. 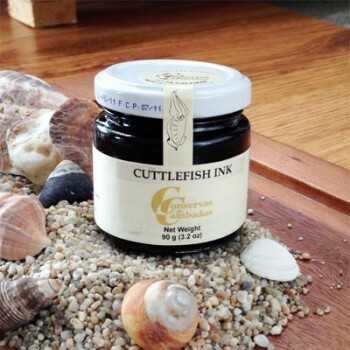 Ingredients: cuttlefish ink, water, and salt. 3.2 ounce (90 gram) glass jar. Small, tender, delicious squid are served in a fantastic tomato, onion, wine, and squid ink sauce. Mix into scrambled eggs or an omelette. 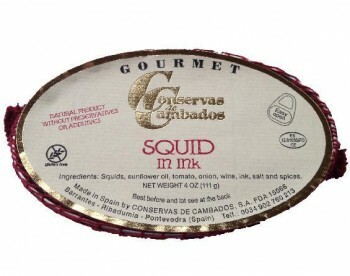 Ingredients: Squid, sunflower oil, tomato, onion, wine, ink, salt, and spices. 4 ounces (111 grams) in a metal tin. Small, tender, delicious squid in olive oil. Simple, pure, delicious! Ingredients: Squid, olive oil, and salt. Wonderful, plump mussels, hand cleaned, and sauteed in olive oil. Selected according to size and hand-packed for your dining pleasure. NOTE: when it says "Fried" we are NOT talking breaded/deep fat fried. Fried, in the Spanish tradition, means they are briefly sauteed in olive oil in a hot skillet. 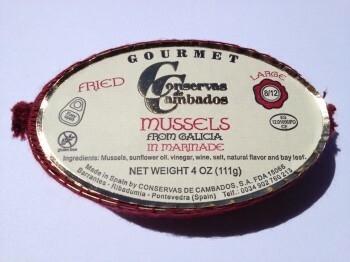 Ingredients: Mussels, sunflower oil, vinegar, wine, salt, natural flavor, bay leaf. 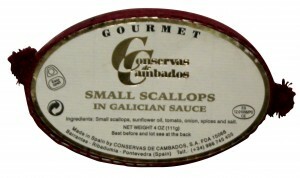 These tiny Calico scallops, also known as Zamburinas, from the Galician estuary in northern Spain, are gently sauteed in a delicate tomato, onion, sunflower oil, salt, and special spice sauce. You can open the can and simply serve them cold, or warm them up gently..... add a squeeze of lemon, some fresh parsley, and serve with crusty bread. Yum! 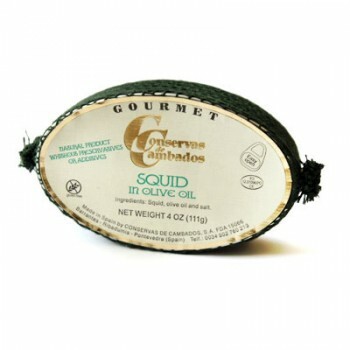 Conservas de Cambados takes great pride in selecting only the best seafood. Each scallop is collected at its peak of flavor and is opened with a special vapor technique. The scallops are then carefully packed in their wonderful Galician Sauce. These scallops are amazing! Ingredients: Small scallops, sunflower oil, onion, tomato, wine, spices, and salt. This delicate, carefully selected octopus is uniformly portioned and slow-cooked in a rich broth until tender. It is then packed by hand in high quality olive oil. Pulperias, restaurants that specialize in octopus, are in every Spanish village. 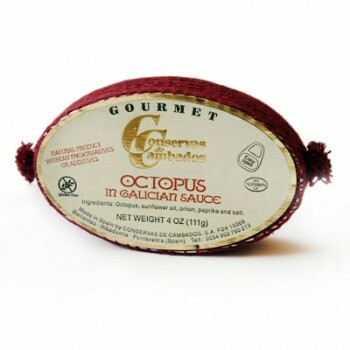 Conservas Cambados has packaged the wonderful experience of the perfect octopus so you can experience it in your own homes. Enjoy! 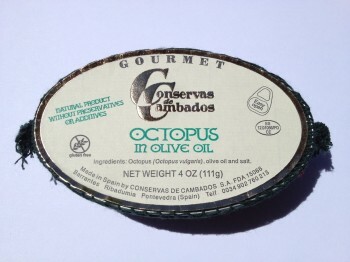 Ingredients: Octopus (Octopus vulgaris), olive oil, and salt.